You are here: Home / Trying to Conceive / Is Your Body Ready for a Baby? Take Our Pre-Pregnancy Quiz! 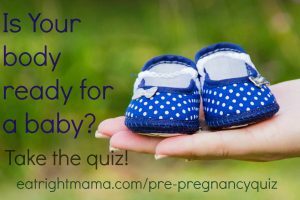 The Pre-Pregnancy Quiz—Are You Ready? You may be mentally ready for a baby, but is your diet? This quiz will help you fine-tune your eating and health habits. I eat at least 2 cups (500 ml) of fruit and 2½ cups (625 ml) of vegetables on most days. I eat a wide variety of foods, including many types of protein foods. 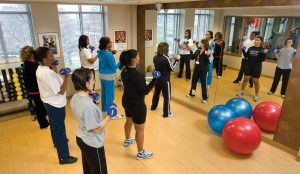 I do some type of aerobic exercise at least twice each week. I don’t smoke and I avoid secondhand smoke. I drink no more than one caffeinated beverage each day. I am at or close to my ideal body weight. I avoid exposure to radiation, pesticides, herbicides, solvents, PCBs, and other chemicals. I avoid eating shark, swordfish, king mackerel and tilefish. I usually eat three balanced meals a day and watch my trans fat and saturated fat intake. I take a multivitamin/mineral supplement containing 400 micrograms of folic acid daily. I have a regular source of Docosahexaenoic Acid (DHA) and other omega-3 fats in my diet. I avoid eating raw milk, eggs, shellfish, or foods that are made with these. (Examples include homemade Caesar salad dressing, mousse with uncooked egg, and sushi.) I also stay away from uncooked sprouts. 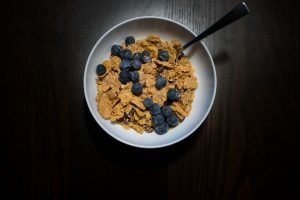 I eat three servings of whole-grain breads, cereals, or other whole-grain products on most days. I live a moderately paced lifestyle, get eight hours of sleep most nights and generally feel happy. I have not followed any drastic diets or had an eating disorder in the last three months. I am a vegetarian who eats no animal products, though I do take vitamin B12 and calcium supplements. I have visited my health care provider and discussed a future pregnancy. Count your “Yes” answers and see how you scored below. 17–21: Congratulations! Your body is ready for pregnancy! 13–16: You’re doing pretty well; you have just a few things to work on for the healthiest pregnancy possible. 9–12: You may need a few months to change your habits for the healthiest possible pregnancy. 0-8: Oops! Your lifestyle may need an overhaul! Talk to your health care provider before trying to conceive! Very informative and interesting article found on internet today. Me and my husband are planning for a baby and this article is going to help me a lot in that. Thanks for the post. Thanks! Glad we could be of help!